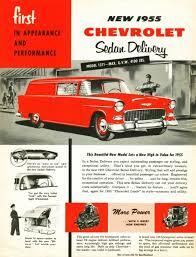 The 1955 Sedan Delivery was a 2-passenger, 3 window, panel delivery wagon. The new "small block" in the '55 Chevy had its problems. Some issues existed with cracked pistons, there was no integrated oil filter, and the factory could only add a bypass externally—owners had to opt for this external oil filter. The filter was also available as a dealer installed option. Those who did not order the engine with the "oil filter option" dealt with a high frequency of oil changes. This was corrected for the next year when a full flow oil filter system was added to the engine. The new small block V8 was relatively easy to maintain however to keep performance and mileage levels high required spark plug and ignition points to be replaced on a regular basis. 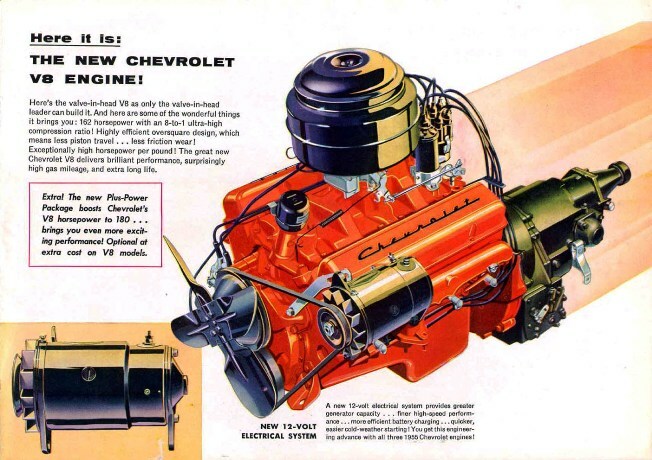 The small block Chevy V8 became so popular that Chevrolet still sells it today as an over the counter replacement engine or better known as a "crate engine". There have been various changes made to the engine to modernize it since its introduction in 1954 however the basic design of the original 265 remains in place. The 55's top trim offering was the Bel-Air, which had more chrome than the 150 or 210. 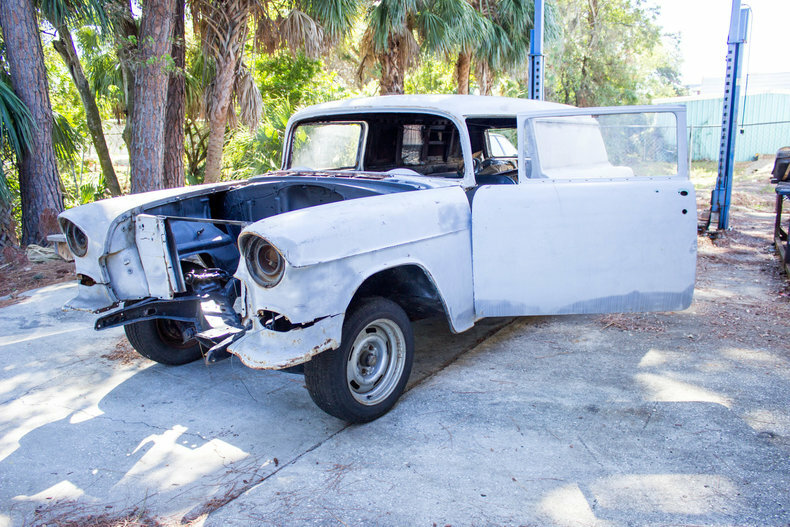 The Bel-Air and 210 could be bought with a post between the front and rear passenger windows, or without a post. Without a post it was known as a "Hardtop," which came only in a two-door and was not offered in a four-door hard top until 1956. The two-door hardtop was also known as the "Sport Coupe." Since the Sport Coupe had no post between the two side windows, it had a slightly shorter roof and longer rear deck and was available with either the Bel-Air trim or the 210. Chevy also offered a convertible, with the same shorter roof and longer rear deck as the sport coupe, and it was offered in Bel-Air trim only. True to Chevrolet's vision, the 150 was no-frills basic transportation. It had limited options, stark trim, solid colors, plain heavy duty upholstery and rubberized flooring. Small things like ashtrays, cigarette lighters and even mirrors were extra cost options. Compared to the mid-level Two-Ten or premium Bel Air models, the One-Fifty was stark and bland. Body style choices were also limited to sedans, Handyman wagons (four-door in 1953–1954, two-door in 1955–1957) and (until 1955) the club coupe. 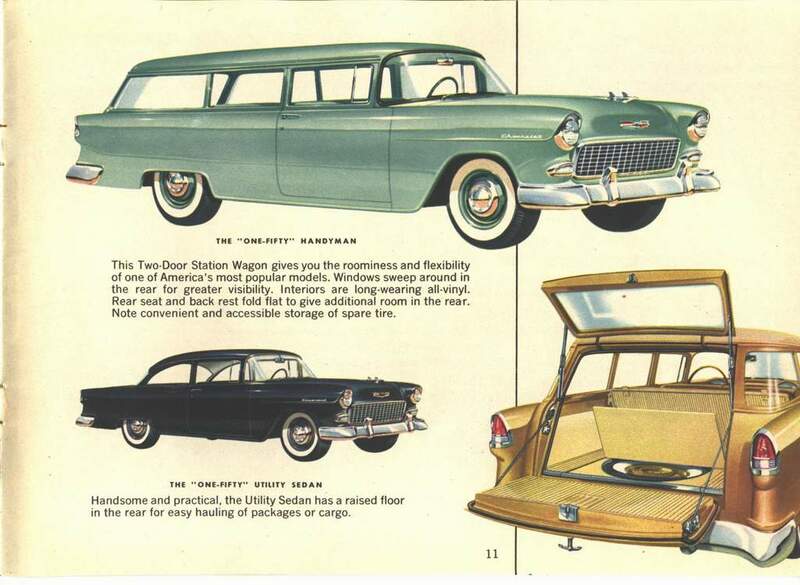 The only body styles specific to the One-Fifty were decidedly fleet oriented, the sedan delivery (a 2-door wagon without rear windows and the rear seat removed) and the business sedan — a 2-door sedan with immobile rear windows and back seat removed. Powertrain choices were limited to manual transmissions and low output engines until 1954. In 1957, a full race-ready version was also available, commonly known as the "Black Widow" for its black-and-white paint color. It was equipped with 4-wheel heavy-duty brakes, 6-lug wheels and dual shock absorbers.